Are you facing a major life decision? Maybe “analysis paralysis” is preventing you from moving forward? Or are you just plain stuck and need advice? Want help? Click I Need Decision Coaching! How Are You Going To Help Someone Today? Today is International Women’s Day! It’s a day to celebrate all the varied and incredible achievements of women around the world. But it is also a day to focus on closing the gender gaps that still exist. In my last post, I shared that I’ve taken on a new challenge. This week, we launched a new website that is focused on women helping other women take control of their finances. 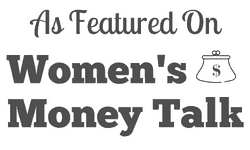 Women Who Money is up and running and we’ve received really positive feedback! I’m buried in requests from women to write for us! What a wonderful problem to have! I’m excited to join a large group of female personal finance bloggers today, as we come together to inspire more women to learn about money. Chelsea from Mama Fish Saves leads this wonderful collaboration! I loved how Chelsea said that we should use today to “shout from the mountain tops” and share a piece of wisdom with our readers. You can’t assume that women who are deep in debt are just bad with money. We should quit blaming (or even shaming) them and start helping them instead. I was lucky to be brought up in a family that was very good with money. My parents worked hard, saved, managed rental properties, and brought up three children. I had very good money role models! Money was not a taboo subject in our family and we were all expected to learn how to manage our money. I’m thankful that I am a woman who ROCKS money. But in the past, I wasn’t very understanding about people who weren’t good with money. Before we get any further, I understand that there are people who are deep in debt who are really bad with their money. And some of them make poor decision after poor decision. But many of those people also had really poor role models as they were growing up. Not all, but many. And it doesn’t matter if they grew up with money or in poverty. Anyone can get in deep debt – and not always because of their bad choices. As readers of a blog about decision-making, personal finance, real estate, and other money topics – there’s a good chance that you are already financially savvy or you are working at better understanding your finances. So today, I have a challenge for you. Instead of looking at someone and blaming their financial situation on their lifestyle or upbringing, make a difference instead. Do you know a woman who could use help with her finances? Share a helpful article with her, suggest a useful money app, or buy her a book on investing. Share community resources that can help her learn to manage her finances. If you know her well enough, offer help whenever she’s ready to take it. What about a woman who wants to start a business? Can you be a mentor? Maybe you could just be a sounding board for her ideas. Is there anything else you can do to help? For women already in business? Skip the big box stores or chain supermarkets and support women’s businesses. If you own a business? Provide your employees with tools and information that help them improve their financial literacy. Don’t assume they know what to access and how to apply what they read or hear. It will be one of the most important benefits you can provide. Visit Women Who Money (my new site) to help you take control of your finances and for a chance to win a ‘Women Rock Money’ T-Shirt by signing up for our email before 7 pm, Eastern Time this Friday, March 9th. This post is part of the #WomenRockMoney Movement. If you have money questions, or want support for your financial goals, learn more about how you can join us at the movement homepage. I love the idea of focusing on supporting women in business! Thank you for the reminder and happy International Women’s Day!!! Thanks, Mrs. AR! It might be easier to hit the big box, but we need to work to support our small businesses too! Powerful stuff, Vicki. For women who want to start a business, I’ve heard Christy Wright on the Dave Ramsey show often. She makes a lot of sense and shows how to build a business incrementally. Thanks, Mrs. G! I’ve heard Christy Wright as well. Love the focus on incrementalism in terms of building a business! Yes, Brian! And you are one of the BEST role models around! More people need to do what you are doing in your community too, We can’t just do it all online. YES! Make a difference. Love it. We’re trying! One post, one person – at a time! I am here to help you! My name is Vicki and the focus of my doctoral program was decision-making! If you are struggling with a decision, contact me now! Note: Ideas and opinions on MakeSmarterDecisions.com are simply the results of my own experiences, and they are not intended to advise or offend. MakeSmarterDecisions.com should be viewed and shared for educational and entertainment purposes only. My posts are based on my personal experiences, and all readers should consider consulting a professional or specialist in a given area (financial, retirement, real estate, etc.) before making any decisions. See full disclosures under the Home Tab.